The supercritical CO2 saw palmetto extract in Super Saw Palmetto with Beta-Sitosterol has been standardized to contain 85-95% free fatty acids and sterols. The Phytosterol Complex contains a natural ratio of concentrated plant sterols derived from vegetable and seed oils including soybean, rapeseed, sunflower seed, and corn. Saw palmetto acts as an alpha-adrenergic receptor inhibitor, reducing urinary urgency and inflammatory actions in the prostate gland. The newest ingredient, beta-sitosterol, interferes with the formation of prostaglandins that cause swelling of the prostate. 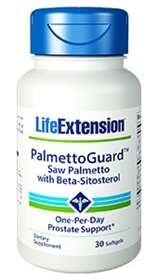 The supercritical CO2 saw palmetto extract in Super Saw Palmetto with Beta-Sitosterol has been standardized to a minimum of 85% free fatty acids and sterols. The Phytosterol Complex contains a natural ratio of concentrated plant sterols derived from vegetable and seed oils such as soybean, rapeseed, sunflower seed, and corn. Other ingredients: pumpkin seed oil, soybean oil, beeswax, lecithin, gelatin, water. Contains soybeans. This product contains NO milk, egg, fish, peanuts, crustacean shellfish (lobster, crab, shrimp), tree nuts, wheat, yeast, gluten, corn, or rice. Contains NO sugar, and no artificial sweeteners, flavors, colors, or preservatives.